Do you know the painting by Holman Hunt, the leader of the Pre-Raphaelite Brotherhood, entitled ‘The Shadow of Death’? It depicts the inside of the carpenter’s shop in Nazareth. 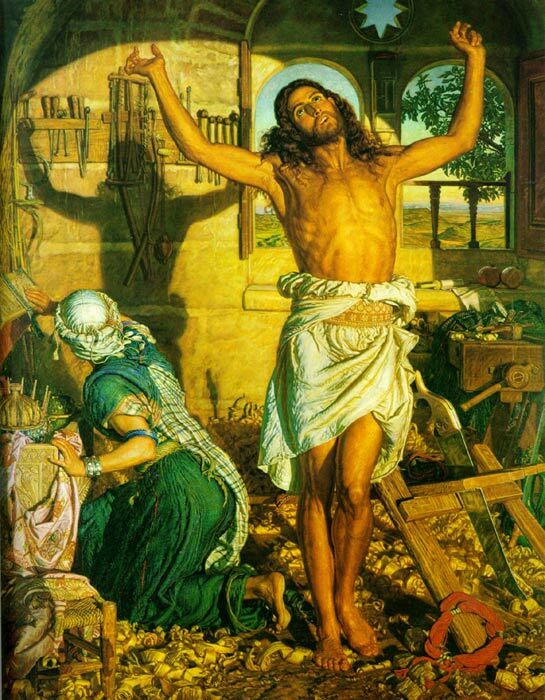 Stripped to the waist, Jesus stands by a wooden trestle on which he has put down his saw. He lifts his eyes towards heaven, and the look on his face is one of either pain or ecstasy or both. He also stretches, raising both arms above his head. As he does so, the evening sunlight streaming through the open door casts a dark shadow in the form of a cross on the wall behind him, where his tool-rack looks like a horizontal bar on which his hands have been crucified. The tools themselves remind us of the fateful hammer and nails. In the left foreground a woman kneels among the wood chippings, her hands resting on the chest in which the rich gifts of the Magi are kept. We cannot see her face because she has averted it. But we know that she is Mary She looks startled (or so it seems) at her son’s crosslike shadow on the wall. The Pre-Raphaelites have a reputation for sentimentality. Yet they were serious and sincere artists, and Holman Hunt himself was determined, as he put it, to ‘do battle with the frivolous art of the day’, its superficial treatment of trite themes. So he spent 1870-73 in the Holy Land, and painted ‘The Shadow of Death’ in Jerusalem, as he sat on the roof of his house. Though the idea is historically fictitious, it is also theologically true. From Jesus’ youth, indeed even from his birth, the cross cast its shadow ahead of him. His death was central to his mission. Moreover, the church has always recognized this. John Stott, The Cross of Christ: 20th Anniversary Edition (Downers Grove, IL: InterVarsity Press, 1989), 17. This entry was posted in John Stott, The Cross and tagged John Stott, The Cross on August 10, 2011 by GlennDavis.